I learned how to hand quilt before I learned how to machine quilt. Actually I enjoy both. But today I am going to focus on hand quilting. One reason is that I can share this WIP with you today, which I am so excited about. It is a single size bed quilt, that I am hand quilting. That bottom row is almost finished. Then the edges. Sew up the binding, and it will be finished!! This pattern is Attic Windows, and the pattern was published in 101 Fabulous Rotary-Cut Quilts, by Judy Hopkins and Nancy J. Martin. Bothell, WA., Martingale Company, 1998, pp. 37-38. It is almost finished. 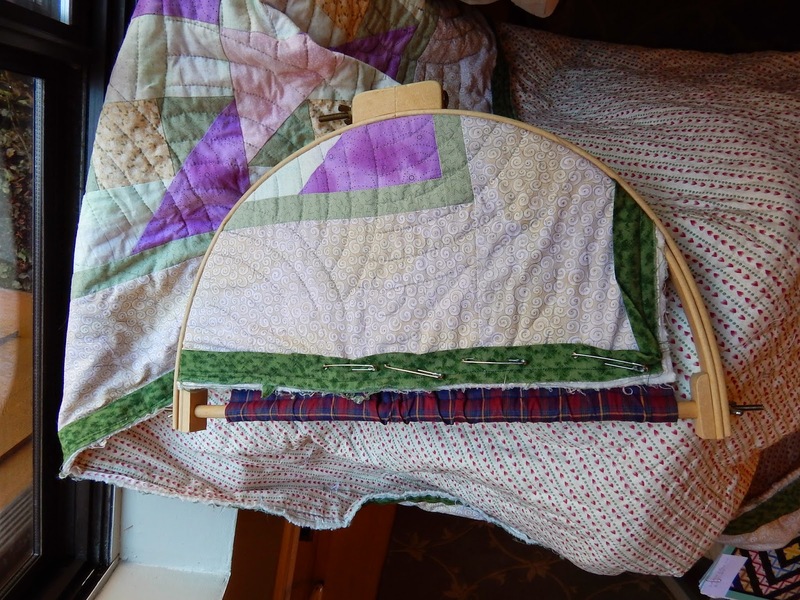 I hand quilt the edges using this half circle hoop. 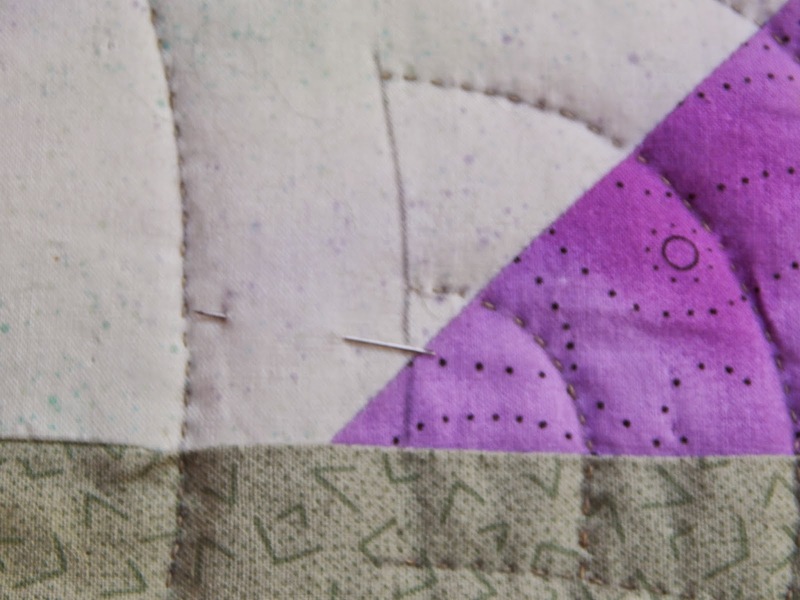 It is great for hand quilting the edges and the corners. I always have one hand quilting project in my WIP projects. Even if it’s a king size quilt. (Not kidding I’ve done one before, and after this I am going to do another king). Doing hand work, is very relaxing and very Zen for me. It’s great to pick up when I’m waiting for a repair person to show up, or I don’t have enough time between two activities to start sewing on the sewing machine. I love to have some hand work to do at night when my husband and I are watching TV. AND, in my bee, we only do hand work, which does not mean just quilting and hand applique. Some members bring crochet and knitting. 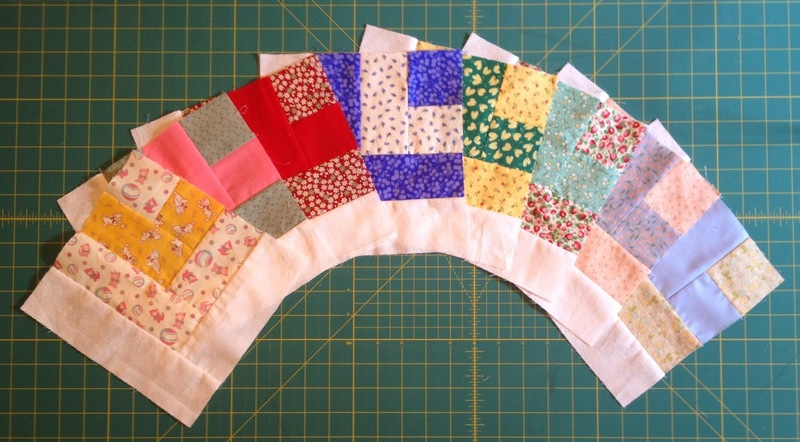 We meet in a church basement every other week, and it would not be easy to bring a sewing machine down the narrow stairs, and all the stuff we need to work on, when piecing or machine quilting. 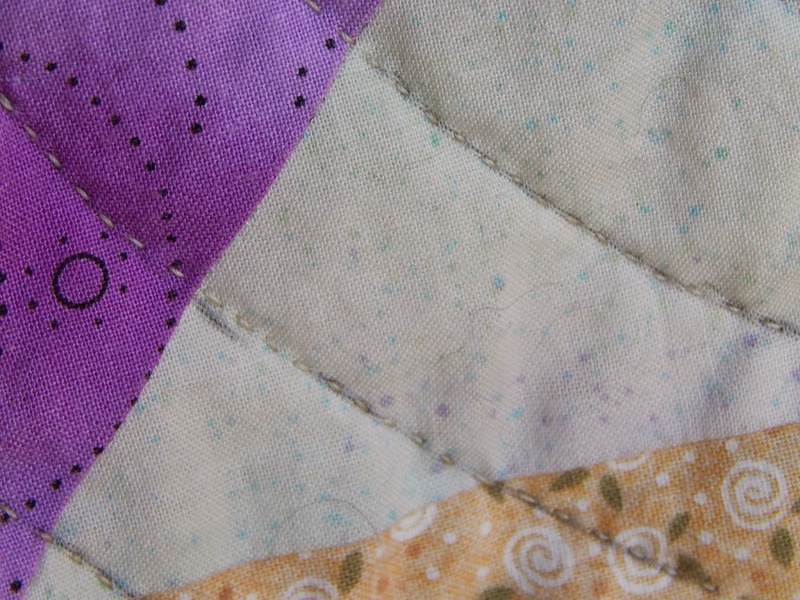 The really interesting part of this story is; halfway through this quilt I was introduced to the Prescencia Thread line. Pepper Cory http://peppercory.blogspot.com/, http://www.peppercory.com/,swears by this thread, and encouraged me to try it on this quilt. I was already halfway finished with another brand’s neutral color. The color shades are slightly different, but I decided to try it, and ended up changing to the Prescencia hand quilting #40 thread anyway. 1. The thread moves so smoothly through the quilt. It glides like skates on really smooth ice, through the three layers. I can do 4-5 stitches at a time. 2. The thread is really durable. 3. I looked at some of my other quilts that are hand quilted. They have been used, washed and dried in home machines, but the color of the thread has faded over time. I know Presencia doesn’t fade. BTW – I am not being paid to write about this. I’m just passing this on because it’s a relatively new discovery for me, and I love this product. 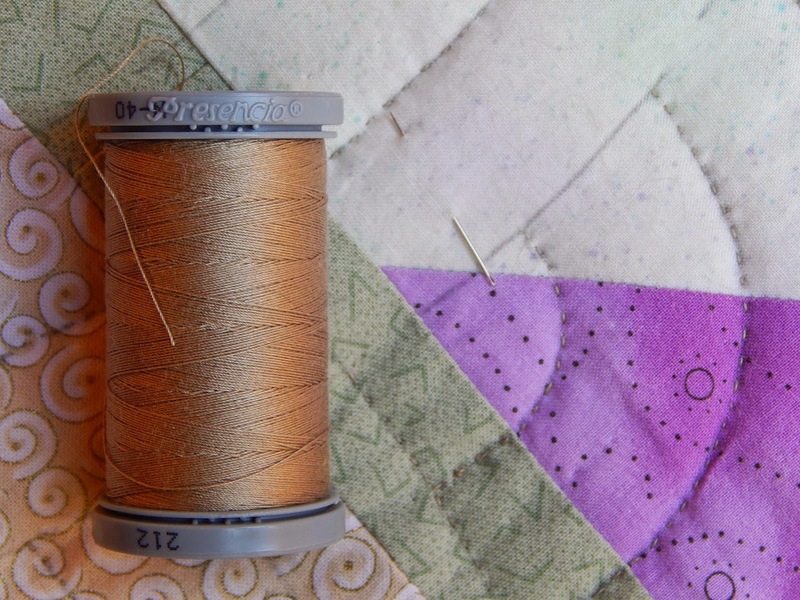 While looking at this quilt that’s in the home stretch, I am awestruck by the color of this thread next to the other thread. I am so happy with it, and am excited to share a great new quilting product. Feel free to guess which is the Presencia. When I post next Thursday, I will tell you which one it is. I am not revealing the manufacturer of the other thread, because this is a positive blog. They make a good product. And, I am not interested in negativity. 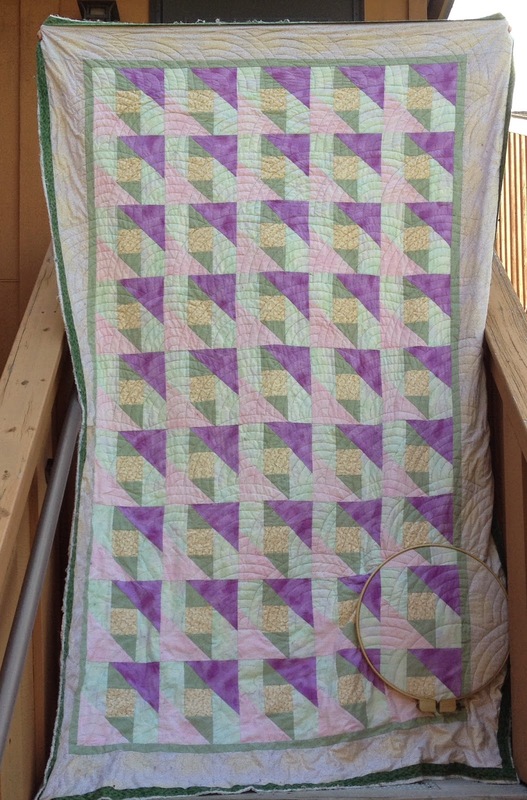 On another note, I did finish all 80 blocks for my Pick & Mix quilt over the weekend – goal accomplished!! Once again, I want to wish everyone a very happy Memorial Day. I am sending out special prayers, and many “thank you’s” to all those who have served, and are serving our country, and their families. You all do so much for us in so many ways.